When Beanie Babies were first introduced to the public back in 1993, they weren’t considered a collectable. 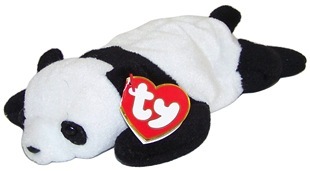 It wasn’t until 1999 that the real Beanie Baby collecting craze began. Even now the original craze has died down, Beanie Babies are still treasured by collectors, with some still fetching a considerable amount of money today. Like with all collections, some factors determine the rarity and value of the Beanie Baby. Since most of the earlier Beanie Babies were given to children to play with, the condition of the Beanie plays a massive part in it’s value. Some of the older toys, before they became a collector’s piece, have been badly damaged through play and general wear and tear. A mint condition 1st generation Beanie Baby is a considerably rare find and very valuable. A lot of the 1st generation Beanie Babies had their tags removed so children could play with them. Those without tags are worth considerably less than a Beanie Baby with it’s tag still attached. If the tag is in mint condition, this makes the Beanie Baby more collectable. A creased tag will significantly decrease it’s value, possibly even by half depending on the damage. 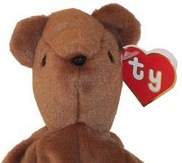 Some Beanie Babies were released with mistakes that were quickly corrected, such as misspelling of the name, it was produced in the wrong colour or the name was changed entirely. Because the Beanie Babies with production mistakes were only in limited supply, this increases their rarity. A number of Beanie Babies were produced as limited editions which are sought after by collectors because of their limited production. Below I have listed the top ten rare Beanie Babies. This list is in alphabetical order and not in order of rarity or value. 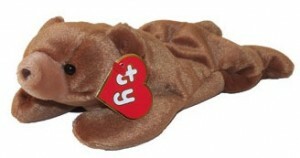 Brownie was one of the Original Nine beanie babies produced back in 1993. He was made from a medium brown material with a tan coloured muzzle and had the signature Beanie Baby black button eyes. Brownie was only released with a 1st generation tag, and as such has neither a birthdate or poem. He was later renamed “Cubbie“ and those with the original Brownie tag are worth a considerable amount. Derby was introduced on to the market on 6th March 1995. His birthday was on 16th September 1995. Four versions were produced of the tan-coloured horse: a version with no star and a fine yarn mane, no star with a coarse yarn mane, a coarse yarn mane with a star and a fluffy mane version with a star. The fine mane version made with twenty strands of fine yarn is by far the most sought after. Later he was produced with only eight strands of a coarser yarn, which was on of the more common versions of Derby. Humphrey the Camel was introduced on 25th June 1994. 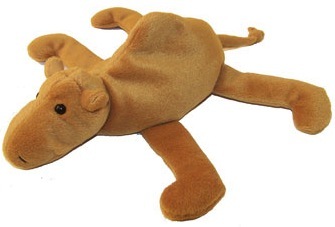 He was a tan-coloured camel with black button eyes and black stitching for his nostrils. Humphrey is considered to be incredibly rare with only 25,000 of him ever produced! He was later made into one of the original nine Beanie Buddies in 1998 and a McDonald’s Teenie Beanie Baby in 2000. Because he was only ever released with 1st, 2nd and 3rd generation swing tags, he does not have a birthday or a poem. He was one of the first Beanie Babies to retire on 15th June 1995. Nana the Monkey was introduced on 17th August 1995. She is made from a medium brown coloured fabric with a tan-coloured face, ears, hands, feet and tail and features black button eyes and black stitching for her nostrils. Nana was retired relatively quickly and re-introduced under the name “Bongo”, making the Beanie Babies with the original Nana tag highly valuable because of it’s limited production. Nana was only released with a 3rd generation swing tag, and as such does not have either a birthday or poem. She was retired later in 1995 to make way for Bongo the Monkey’s release. Peanut the Elephant was introduced on 3rd June 1995. She was first released in a Royal Blue colour, presumably as an error in production and was later re-released in a light blue colour instead. The original Royal Blue colour Peanut the Elephant is considered one of the most rare and valuable Beanie Babies available and fetches a high price on the secondary market and at auction, if you can find her. The Royal Blue version is a dark blue colour with light pink on the inside of her ears and features black button eyes. Peanut the Royal Blue Elephant was later released as a Beanie Buddy in 1998 and a McDonald’s Teenie Beanie Baby in 2000. Peking the Panda was introduced on 25th June 1994. He is white on his main torso with black limbs, a black band over his body, black ears, black eye patches and a black tail. He fetches a considerable price on the secondary market and at auction as he was only released with 1st, 2nd and 3rd generation swing tags and as such has no birthday or poem on his tag. Peking was retired on 7th January 1996. Punchers the Lobster was introduced on 6th January 1994. 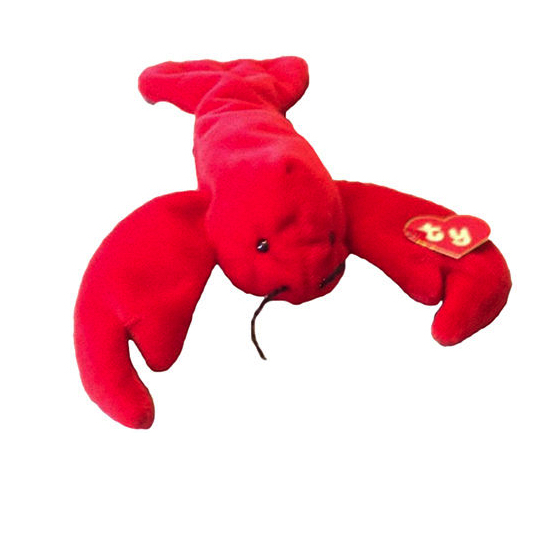 The name “Punchers” is thought to have been a spelling error as those Beanie Babies with the name Punchers disappeared from the shelves and were replaced by the renamed Pinchers the Lobster. 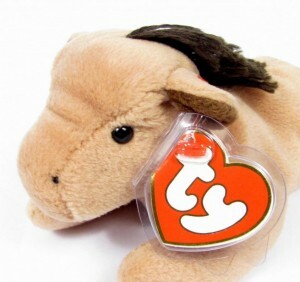 Those with the Punchers swing tag are among the rarest and most valuable Beanie Babies in existence, selling for a considerable amount of money on the secondary market and at auction. 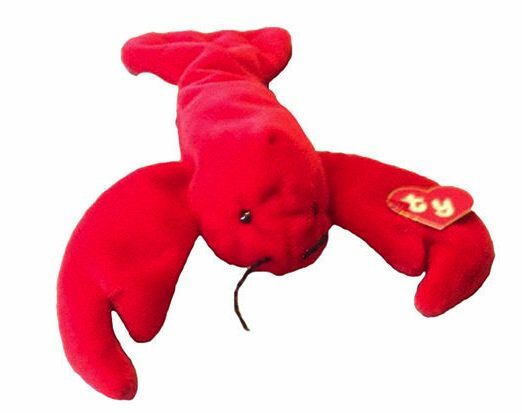 Punchers is made from a bright red material and features black button eyes and black thread antennae. He was retired later in 1994 to be replaced by Pinchers the Lobster. Quackers the Duck was introduced on 25th June 1994. Originally he was shipped without wings but later re-introduced with the missing wings. Around 780 of the wingless Quackers Beanie Babies were shipped making them incredibly rare and valuable. At auction and on the secondary market he sells for a substantial amount of money. The version with the missing wings was only released with 1st and 2nd generation swing tags so they didn’t have a birthday or poem inside the tag. 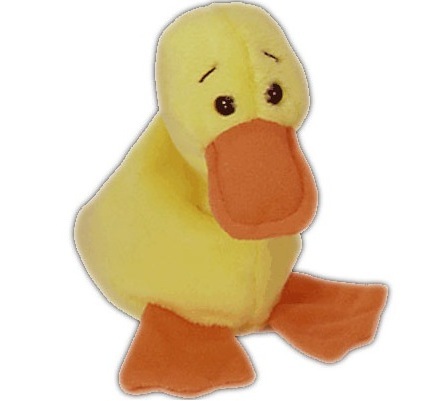 Quackers is made from a bright yellow material with a bright orange bill and feet. He has black button eyes and black stitched eyebrows giving him a cute expression. The wingless Quackers was retired on 7th January 1995. Spot the Dog was released on 8th January 1994. Oddly, he was first introduced without a spot. Later versions of Spot the Dog included the missing spot, making the earlier “spotless” versions highly valuable a auction and on the secondary market. 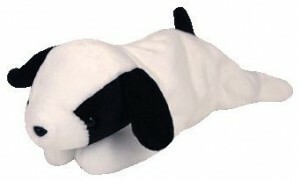 Spot is made from a white material with black ears, a black patch on the left hand side of his face and a black tail. He features the usual black button eyes and a black button nose. Because the spotless Spot the Dog was only released with 1st and 2nd generation swing tags, he has no poem or birthday. Spot the Dog without a spot was retired on 13th April 1994 and replaced with the version with the spot included. Teddy was introduced on 25th June 1994. The bear was released with two different styles of face (an old face and a new face) and was created in six different colours: brown, cranberry, jade, violet, teal and magenta. The brown version with the old style face is the most sought after and fetches a hight amount at auction and on the secondary market. It is made from a brown material and features black button eyes and a black button nose. It’s muzzle is more pointed in appearance and made to look like and older style teddy bear. Teddy was released with no poem and no birthday. It was retired on 7th January 1995.